I’m not sure whether the weather or last year’s grazing management (or a combination of both) were responsible for the explosion of prairie gentian this year. I need to dig through our seed harvest records and my field notes and see if I can figure out what other year we saw a similar phenomenon. It’d be interesting to see if I can find a pattern of response. A close-up view of one of the flowers. They certainly have a distinctive bloom. Interestingly, I didn’t see any insect pollinators on them at all – though nearby prairie clover plants were being mobbed by honey bees as well as native bees. I don’t feel like I did a good job of capturing the scene very well. Sometimes, I feel like my photos end up pulling out selective views of a prairie that overestimate the aesthetic beauty and abundance of flowers there. In this case, it was the opposite. You’ll just have to use your imagination! Our restored wetlands at this site are long winding sloughs (shaped like shallow wide stream channels), and there was a 8-10 foot band of prairie gentian along each side of the entire length of several sloughs. 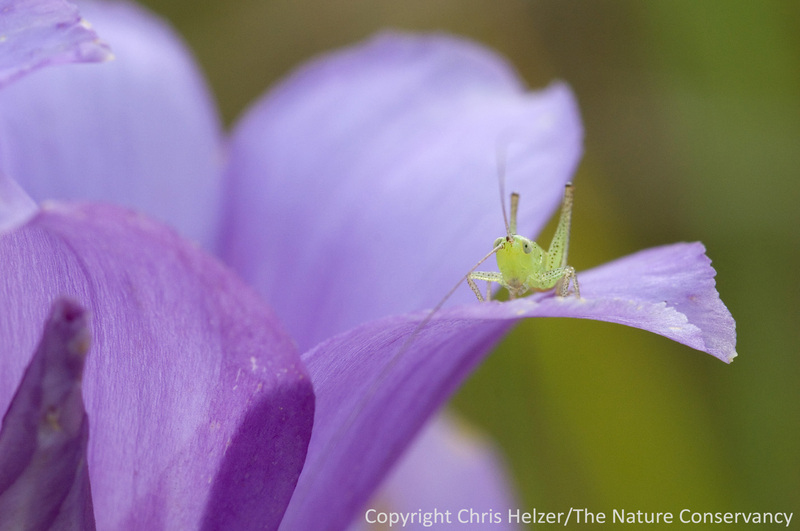 This little katydid nymph was perched on the petal of one of the flowers. It was the only insect I saw on any of the flowers – very surprising. They do apparently get pollinated, since they’re all annual plants and had to have come from seed dropped by previous generations. I’m curious to know what insect pollinates them (and when!). 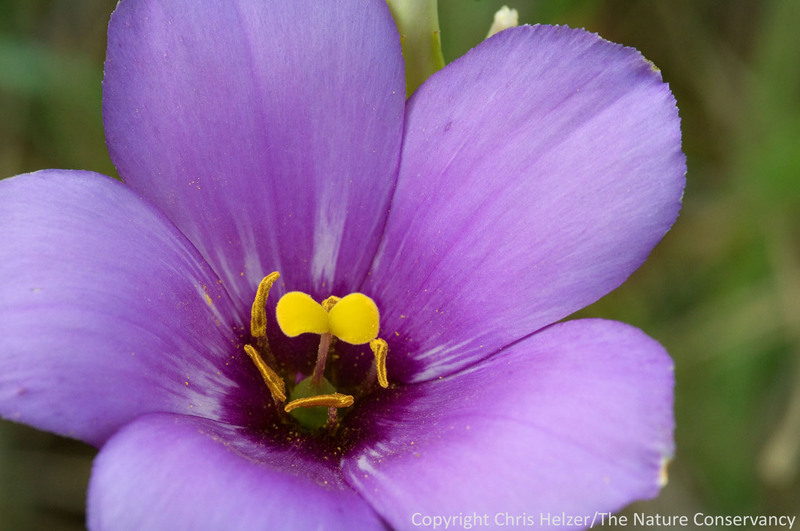 This entry was posted in General, Prairie Natural History, Prairie Photography, Prairie Plants and tagged eustoma grandiflorum, grassland, image, photo, photography, platte river prairies, prairie, prairie gentian, restoration, wetland slough, wildflower by Chris Helzer. Bookmark the permalink. That picture with the katydid is amazing! Thanks Kathy – he was a cute little guy, and sat nicely for me! 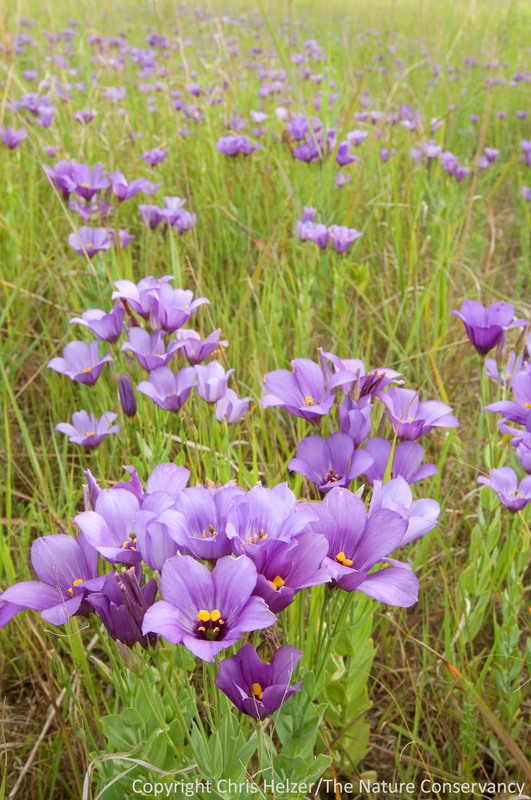 Our volunteers found your field of gentian today. Your pictures didnt hold a candle to what we saw!!!! WOW!!! Found a few white ones too!! !